One of my eighth great grandfathers traveled from Italy to Quebec over two hundred years ago. He was born in the Ligurian city of Genoa in the late 1600s, left as a youth and traveled to the New World. After marrying the daughter of the post master in Quebec City in 1714, he never went back to his Italian homeland as far as we know. Italy has always called to me since I first heard that story. Two years ago, I had the pleasure of traveling to Firenze and Roma with my family. While I was not able to make it to Genoa, I did get the chance to dip my toes in the same Mediterranean waters that he probably touched, albeit two hundred years later. Walking around Rome, and seeing the expanse of marble on every corner, gave me a sense of awe about the monuments accomplished by these ancient peoples. One of the highlights was a tour of the Colosseum. Any fan of SEC football knows that LSU’s Tiger Stadium’s outdoor facade bears a striking resemblance to that ancient edifice, so standing inside and outside of that structure was all the more impressive. I am not naive; I realize that there were many great and terrible events that took place in Rome’s stadium. But, standing amidst the remains, I could not help but wonder what non-deadly spectacles were presented in the arena. Could a game give me that feeling of standing in the midst of a large arena, marshaling my actors, props and animals to put on a giant display of athletic ability? For years, there was such a game, but it was hard to find and expensive when you did. Anyone that listened to the Dice Tower after 2007 heard Tom and Sam extolling its virtues. Colosseum is a 2007 release designed by Wolfgang Kramer and Markus Lübke. It was recently released by Tasty Minstrel Games with all new artwork and a deluxe edition that includes heavy metal coins and upgraded components. 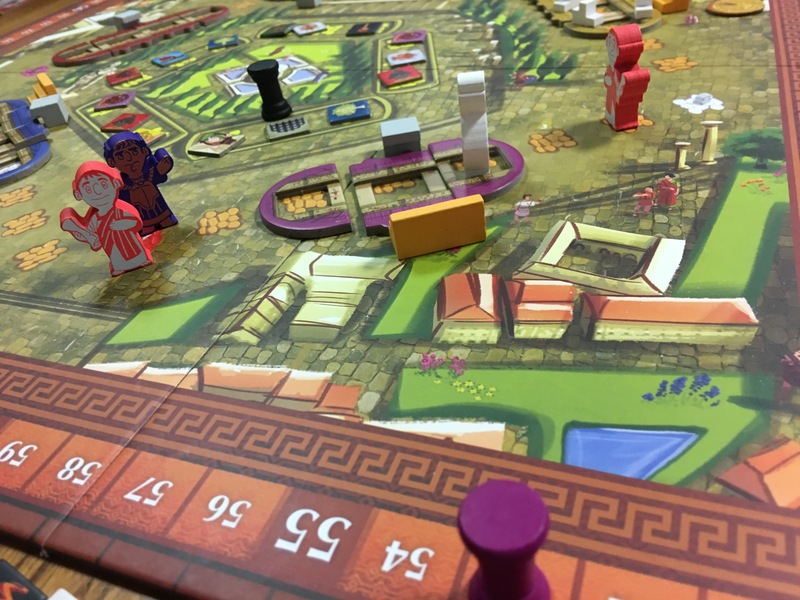 Colosseum plays from three to five players in about an hour and half, although your first play will probably be closer to two hours. 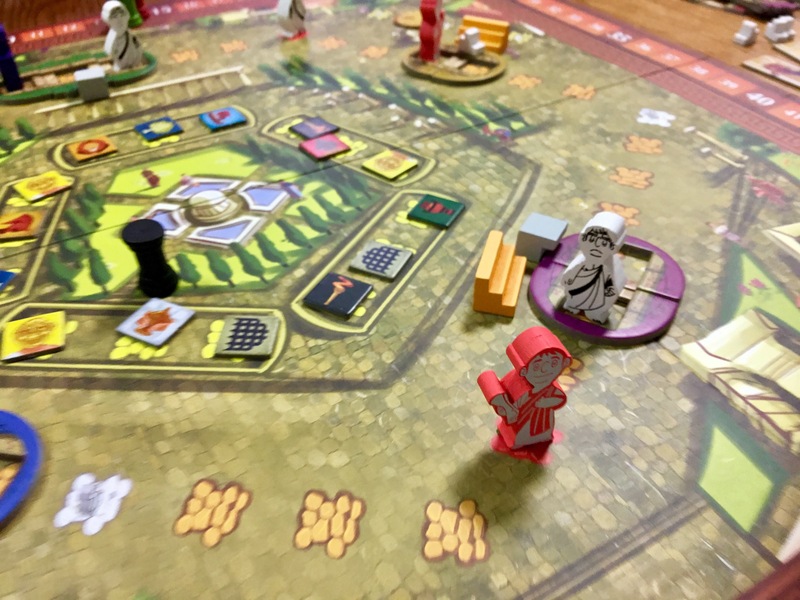 It has been nominated for numerous awards, including a 2008 Golden Geek Best Family Board Game Nominee and an IGA award for best strategy game. 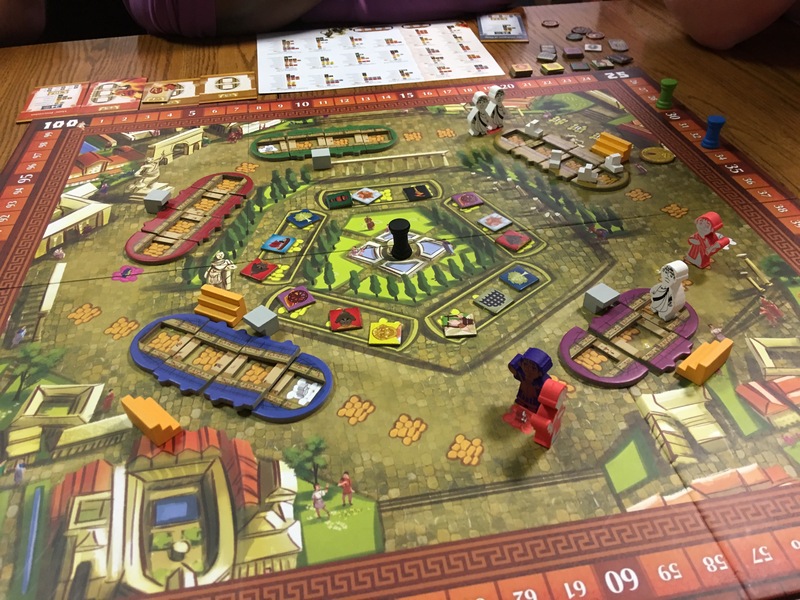 Players act as “Roman impresarios” who collect the various elements to put on ever more spectacular shows. Played with the right group, the theme really shines. The visual 3d elements included in the game plus the numerous different show elements (animals, props, actors) all add to the feeling that each player is putting on an ever more complicated show. 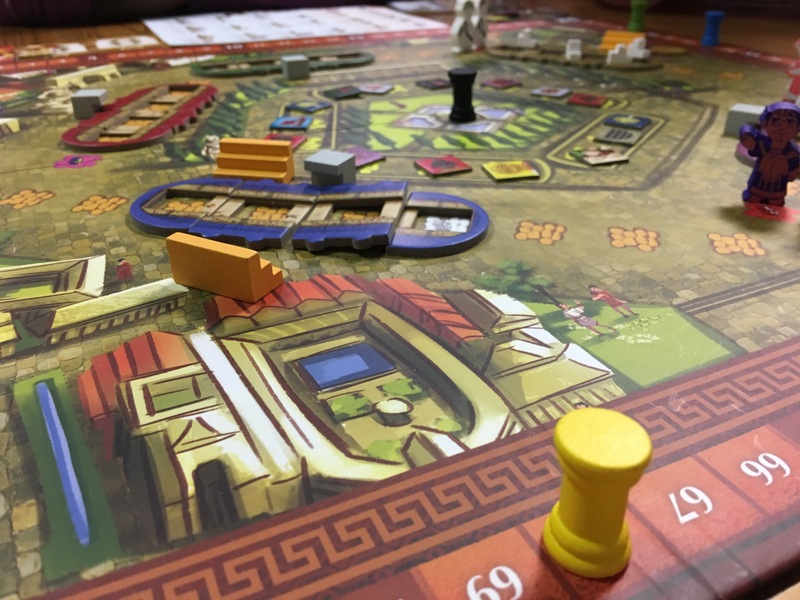 I’ve played the game with the Kickstarter edition from TMG, with metal coins that clink satisfactorily on the table, and upgraded components to really make the pieces pop on your table. I have not seen the retail version, so I cannot comment on how it looks. The game comes with a large game board (yes, I know it is a little smaller than the original, but since I never played the original…) and an excellent rule book. 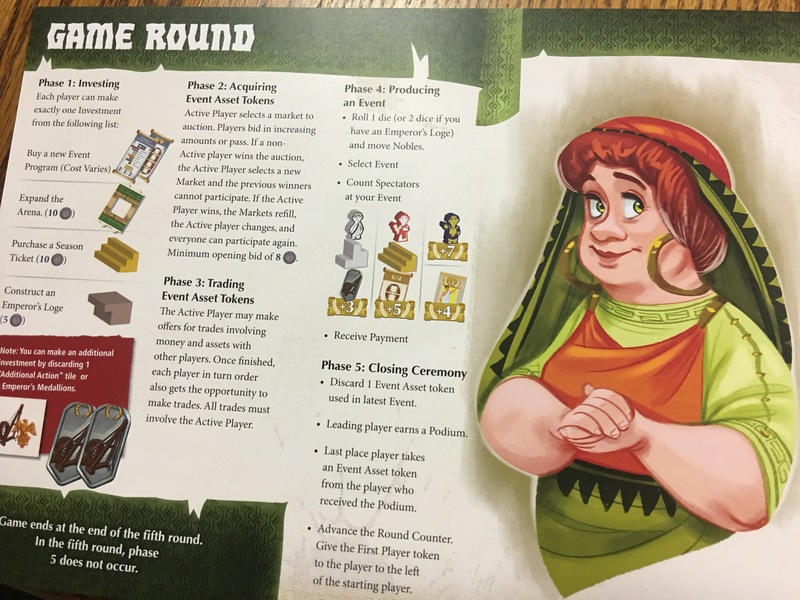 The artwork through out the game was done by Jacqui Davis with graphic design by Daniel Solis (who you will remember from his design with Kodama: The Tree Spirits and his handiwork in numerous other games.) I have seen pictures of the original artwork, and it was very classy and well done, but I have no problems at all with the new design. The colors pop, the artwork is interesting without being cartoony, and for the most part, it is easy to read the icons and cards. For a ten year old game, Colosseum still feels fresh. It takes some very simple mechanics (rolling and moving, set collecting, bidding and trading) and overlays them with interesting decisions. While there is nothing here that has never been done before, back ten years ago it was likely a unique combination of mechanisms that still hold up today. The game is surprisingly easy to teach, although maybe I shouldn’t be surprised since it was originally a Days of Wonder release. That company is known for games that appeal to both gamers and family first timers alike. The set collection and auction bidding mechanics are a little more advanced than say your basic three rule game of Ticket to Ride, but I would not hesitate to bring this out with a game group that is less than experienced. Like any good auction game, the game comes down to players spotting trends in the scarcity of show elements and outwitting each other through bids and trades and show purchases. 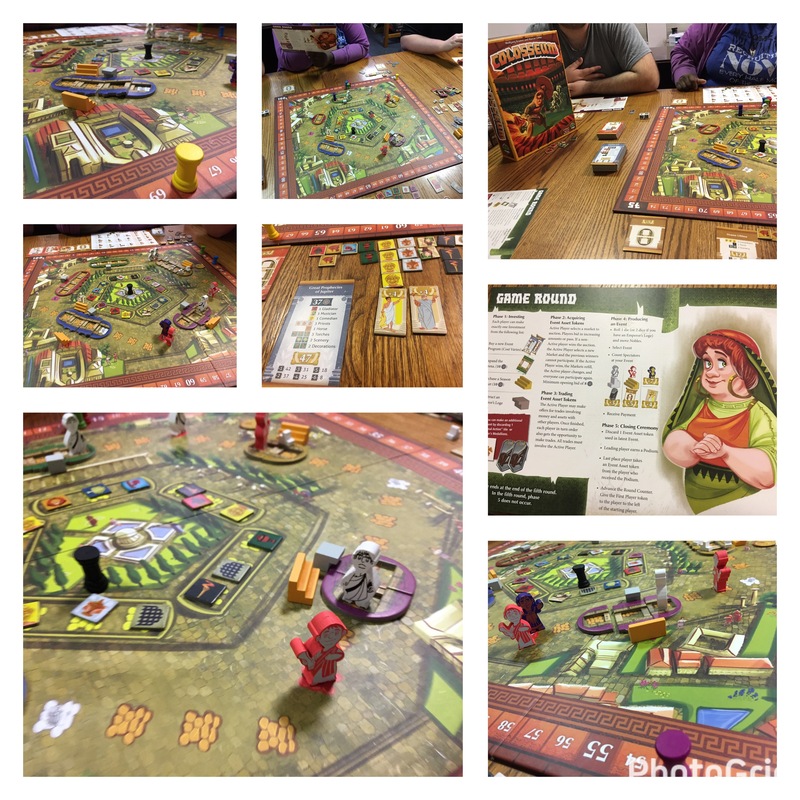 It is definitely a good next step up from your general gateway type games, and should be very easy to teach for families who have a little experience in playing games. The game plays over five game rounds, each broken up into five phases. Essentially, players take turns INVESTING in their show (upgrading their arena or buying a new show), ACQUIRING new assets (participating in the auction for the available show assets), TRADING the various asset tokens, PRODUCING the event (using the show assets at hand with some special rules to help players who don’t have enough assets with negative points attached to taking advantage of the breaks, and finally CLOSING CEREMONIES (bonuses and clean up time). There are some delicious decisions throughout the game. 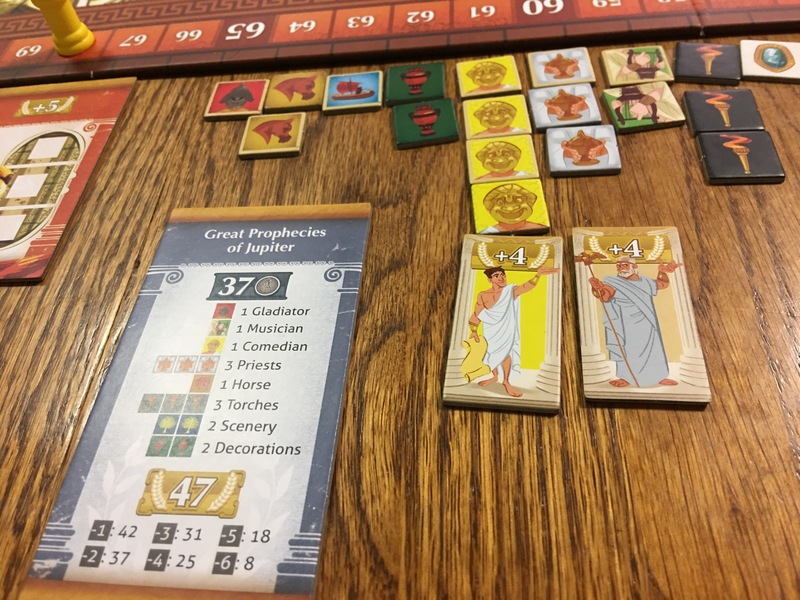 Players can score more points if they can somehow roll and move nobles (senators, consuls, and the emperor) into their show, but it takes careful planning to do so. Players need to look at the scarcity of the show elements versus the point totals on the various shows and balance how far they are willing to push their luck that those show elements will come out in the bidding process or be available in the trading phase. There’s even a bit of engine building as players invest in upgrades for their arenas. The game is not for everyone. 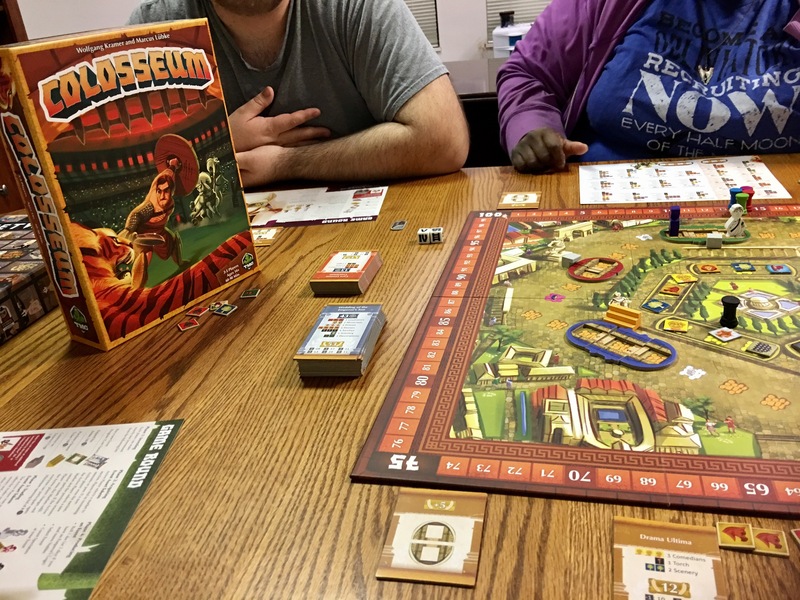 If your game group does not like auctions or bidding, then Colosseum will be a hard sell. A really aggressive player who is good at economic games will definitely have an advantage over players enjoying the ride of building out better shows each round. That can rub some people wrong if they go into this game thinking it is yet another solitaire Euro, because it is not. Controlling the auction and the show pieces can be a big part of the game, and conversely, not being able to buy or trade for the pieces you need can be very frustrating. A minor downside is the card art for the shows. For some reason, the little icons don’t seamlessly match up with the card art, especially for the bonus star performers. It took a couple of rounds, but eventually people were able to distinguish the different types of actors versus the bonus cards, but I think this could have been done better with more appropriate iconography. I have not played Colosseum enough yet for a full review. This was a grail game for me, as I love the theme and mechanics and the style of play. I love Euro games that include a little more interaction then your typical point salad game, and I love how there is bluffing and bidding in what otherwise would just be a rote collection game. I love the Dukes of Dice six point rating scale, and really admire the simplicity of giving each game a grade. 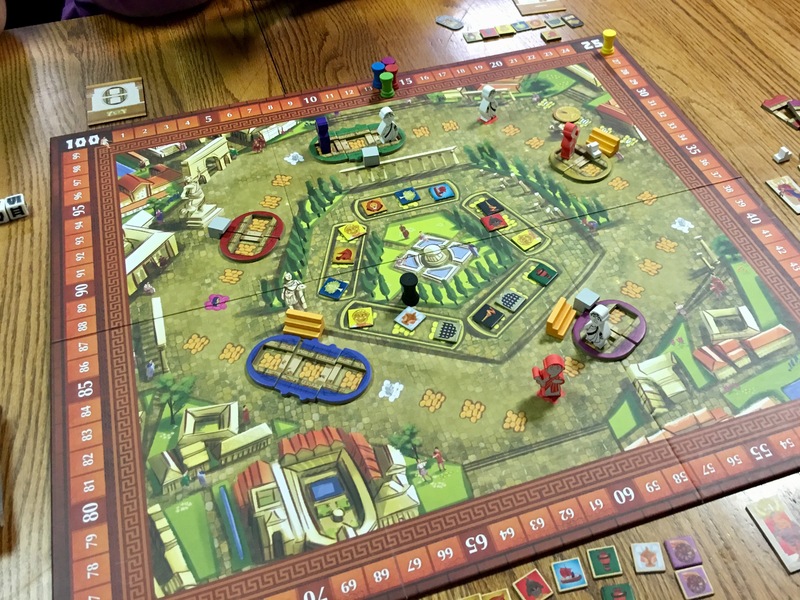 I cannot say I have played Colosseum enough to give it a score yet, but even after just a few plays, I am leaning toward a four (a good game worth playing, just not all the time, but belongs in your collection) or a five (a great game, will rarely turn down a play of it). I have played it at four player counts and at five players too, but would really like to see how it plays at three before deciding. The real questions when I purchase a game like this are whether I have enjoyed playing and do I want to play it again. The answer to both is a resounding yes — I enjoyed both of my first two plays, and I definitely cannot wait to play it again.